Stephen Hawking left us. He died yesterday, early, at his Cambridge home. An internationally renowned physicist and mathematician, he has fought most of his life with a disease, the SLA, that hindered his autonomy and movements, but has never shrunk his great passion for study and research. He has never ended asking questions, the ones that emerge when we allow mathematical formulas to reach the origin of all things, as it occurred in his studies. Important questions, to which he has come back in recent years, with interesting developments in his thinking. We chose to point out here one of the many reasons of interest for the life and the scientific work of Hawking. There were not many people (in truth we do not remember others) that saw kneeling in front of them a Roman Pontiff. It happened to Hawking on April 19, 1975, when the young Cambridge researcher, then aged 33, received from Pio XI a medal for his studies in black hole physics. 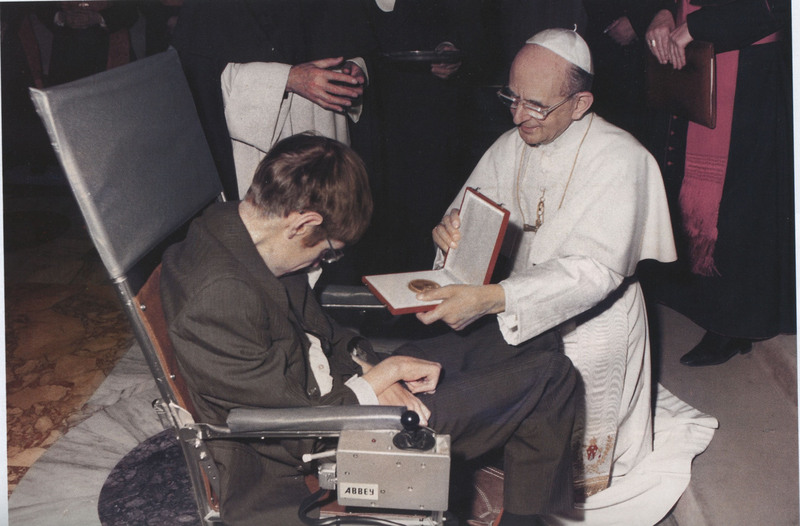 In order to deliver the award to Hawking, and to talk to him - at the time already locked up in a wheelchair by Lou Gehrig's disease - the Pope remained beside him, with both knees on the ground, for a couple of minutes. Member of the Pontifical Academy of Sciences since 1986, Hawking had listened to and met John Paul II and Benedict XVI, and he could exchange with them a few words. It happened for example on October 31, 2008, during an audience given by Benedict XVI to the Academics reunited for a week of study on "The scientific understanding of the evolution of the cosmos and of life." More recently, he met Pope Francis at another meeting of the Pontifical Academy of Sciences, on November 29, 2016, but the two could exchange only a few glances. He faced his illness with courage and hope, not giving up either research or teaching, instilling in everyone passion for the research, and obtaining outstanding scientific results. I was present at a week of study of the Pontifical Academy of Sciences in 2008 and can testify the atmosphere of interest and respect in which the participants followed his speech. That was for me the last time I had the opportunity to meet him personally. We all listened with great silence to the sentences uttered by the vocal synthesizer, which offered the fruit of his lively intellectual reflection. His daughter and his assistants were beside him, facilitating his task with great care. Hawking exposed the enormous progresses in cosmology during the recent decades and concluded his report by saying that «we are getting close to answering the age old questions: “Why are we here?” “Where did we come from?” I believe - he added - these questions can be answered within the realm of science». Beyond the methodological questions that such a position can provoke, and that other distinguished scientists present in the Academy, such as the director of the Genome Project Francis Collins, opportunely pointed out on that occasion, Hawking expressed a real perception: contemporary science, precisely because of the depth and unity of its research, aims naturally towards philosophical and existential questions. The scientist, as a man, perceives and highlights them. In an era of scepticism and “weak thought”, even if he may risk thinking that the empirical method is sufficient to answer those existential questions, this stance contributes to keep them alive, to launch them again, to point them out as the questions that really count and for which it is worth investing life energies - as in Hawking’s case. In some of his comments, Hawking does recognize with amazement the mystery of being and of the existence of natural laws, for which he hesitated to propose a totally reductive and physicalist interpretation. Right at the end of his book A Brief History of Time: From Big Bang to Black Holes (1988), the English physicist wondered: «Even if there is only one possible unified theory, it is just a set of rules and equations. What is it that breathes fire into the equations and makes a universe for them to describe? The usual approach of science of constructing a mathematical model cannot answer the questions of why there should be a universe for the model to describe. Why does the universe go to all the bother of existing? Is the unified theory so compelling that it brings about its own existence?». These are questions that continue to be enigmas for us, but for Stephen Hawking, now at the gates of the mystery, most likely, they are not anymore.